The inscription (probably 16th or early 17th century) at the top of the page says that this section containing laws from the "reign of Henry II to Edward III was taken from the great roll in the archives of the Tower of London and begins with a copy of Magna Carta." The portrait of a king differs in style from the 'Queen Mary Psalter' but resembles the work of some London painters working in the 1320s. It probably is meant to portray the King Edward mentioned in the sentence next to it, but if it is Edward III (1327-1377), it would be after 1326 or 1327. The arms in the lower border are Robert Cotton's elaboration of the Cotton-Bruce family. 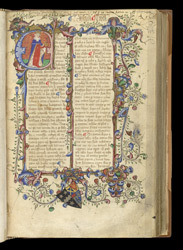 Cotton acquired the manuscript in the late 16th century.